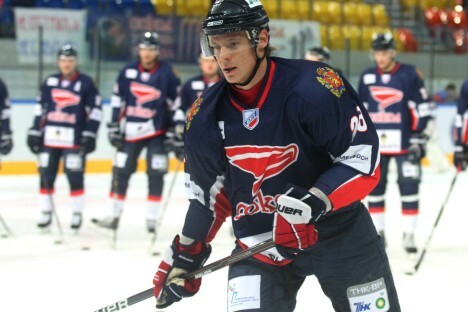 During the NHL lockout, Krasnoyarsk native Alexander Semin will be playing hockey for free with his hometown team. The two-time world champion has decided to return to the squad where he first learned the ABCs of hockey. Unlike many Russian NHL stars who have signed rather lucrative contracts with KHL teams during the lockout, Semin preferred to take a different route. It turns out that Sweden is not the only country to have altruists willing to volunteer their ice time to their maiden teams during the NHL lockout. St. Louis forward Patrick Berglund made the same move that Semin would eventually make, when he signed with Sweden’s Västerås minor league team during the lockout. The Swedish star’s sponsor covered his insurance, and Berglund himself did not ask for a salary. How Sokol will deal with Semin’s insurance has not yet been disclosed, but Alexander has likely already taken this into account. Strictly speaking, Sokol was not Semin’s first team. He left Krasnoyarsk when he was still a junior and signed his first contract with Traktor Chelyabinsk. When he was 19, Semin went to conquer the NHL and spent the season with the Washington Capitals. He returned to Russia during the 2004–2005 lockout and spent two seasons playing for Lada and Khimik, before returning to play six full seasons with the Capitals. Washington fans loved Alexander Semin, who played alongside “Alexander the Great” – namely Alexander Ovechkin. Later, Sergei Fedorov joined the Capitals to form a Russian trio, which was later called on to play for team Russia at the 2008 World Championships. This is where Semin won his first gold medal; he won his second gold this past spring with the Russian national team in Helsinki. Semin signed with the Carolina Hurricanes in the summer of 2012, but he has yet to step on the ice for his new team. His role on Sokol’s squad fits him just fine, even though he is not being paid – not by Sokol and not by the NHL, whose players’ union is fighting with the heads of the league over their compensation. Semin’s debut with Sokol took place on 28, when the team faced off with Kazzinc-Torpedo. And there might be another reason for this specific date of his debut: Semin’s usual jersey number is 28.